Have you thought about your New Year Resolutions yet? In just a few hours it will be 2012. On New Year’s Eve I always find myself wondering what the new year has in store? It is no figment of my imagination, that the older I get, the faster the years pass by. Last year at this time, I would have been surprised to know I would be finding new friends all around the world through conversations on this blog! Thank you to everyone who has stopped by or left a comment. I am thrilled you found me and I hope you share my blog with your friends. Fortunately the blog continues to gain followers and many share they find the site helpful. If there are topics you would like to see presented, please leave a comment and let me know. My intention is to offer useful information while I share my personal joy and passion for life. I look forward to the many possibilities and opportunities that the future may bring my way! New Year resolutions always enter into conversations this time of year because it is a new beginning; a chance to redo, rethink, re-be who we are. Of better consequence would be to ask ourselves in December, how much success we had accomplishing the resolutions set at the beginning of the year. That question would help us learn how to set appropriate and reachable goals and understand how better to accomplish them. Goals need to be highly motivational, pertinent, realistic, and organized into sequential steps to ensure we accomplish the big goal. Last year I wanted to begin an educational blog and open a shop on Etsy. I did get both of those goals accomplished but I realize I need to think bigger and move forward with my dream. I want to explore the possibility of beginning an agritourism vacation program on my farm aimed at providing opportunities for families to visit, explore, and learn about land stewardship, growing fruits and vegetable and preserving them to eat later, raising dairy goats, chickens, quail, and many other farm life activities my husband and I enter into every day. Small family farming is going the way of the dodo and hearth and home skills are being lost to the public at large, as those of us who practice them grow older or don’t share what we know with those that don’t. It’s a big dream, but a dream of value to those that yearn to better understand where their food comes from and how they can be a part of feeding and providing for themselves. Many people will gather with family and friends tonight to welcome the New Year in style. Some will celebrate with champagne, finger goods, and gourmet desserts, others find hot wings and beer just the ticket. However you plan to spend the evening, savor each precious moment spent in good company! Be forgiving of yourself, Rejoice in the accomplishments of 2011 and Begin the journey of reaching your goals for 2012. Think positively, Think Big, and be courageous! The only thing holding you back is yourself so get ready and begin the adventure! Look for Simple Pleasure Treasures along the way and share your joy of life with as many people as you can. 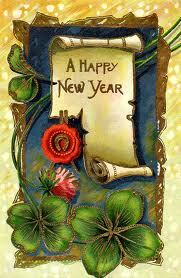 I wish you all a Happy and Wonderful New Year! This entry was posted in activities, DIY, food preservation, gardening, Household, Life's Simple Pleasures, Organization, Seasonal and tagged agritourism, family and friends, goal planning, goals, haycation idea, New Year, resolutions, success. Bookmark the permalink. 2 Responses to Hat’s Off to the New Year! I used to be very happy to search out this internet-site.I needed to thanks for your time for this excellent read!! I definitely having fun with every little little bit of it and I have you bookmarked to check out new stuff you weblog post. Thank you for leaving a comment! So glad you plan to visit again.